Small town in the Papal States near Pesaro. Jewish bankers of Fano are known to have had a large financial transaction with the Malatestas (the rulers of the city) as early as 1332. There was a great demand for loans in that agricultural region, which possessed little capital. The Jewish bankers were well received and, winning the confidence of the authorities, were granted extensive privileges and were efficiently protected. At this period the Jewish community was so large that it paid taxes amounting to half the sum collected from the entire town. In 1367, when the heretics were expelled from the city, the Jews were expressly excepted. In 1447 the Malatestas defended them against the demands of the papal chamber for a Jews' tax. The bankers were treated as full citizens, and were exempt from all taxes. When the privileges were renewed in 1430, and the Jews demanded assurance against persecution and spoliation, the demand was granted. The Jews' badge was introduced into Fano in 1464, but the bankers were not required to wear it. At the same time they were secured against repudiation of debts. When in 1492, after the affair of Simon of Trent, a preacher attacked the Jews in his sermons and brought against them the blood accusation, some of the city councilors rose to defend the Jews and to protest against inciting the populace. The city was, in fact, excommunicated three times within forty years because of its too lenient treatment of the Jews. The founding of the Monte di Pietà in 1471 did not detract from the wealth or the popularity of the Jewish banks. The security enjoyed by the Jews of Fano naturally induced others to settle there. In 1435 they formed a fairly large community. The later comers, however, were not full citizens; they were subject to the restrictions obtaining at that time, and were obliged, after 1464, to wear the Jews' badge. The hostility of the Christian populace, which was also felt by the bankers, forced some families to emigrate in 1452. In the second half of the fifteenth century, in consequence of the attacks of the monks, the relations between the Jews and Christians became even more unfriendly. It is recorded that in 1460 a Jewess, Perna by name, applied for permission to practise medicine. In 1542 Fano received many of the Jews who had fled from Sicily. It seems to have had an unprejudiced cardinal, who in 1553 disapproved of the burning of the Talmud and other Hebrew books. The community was dissolved on the expulsion of the Jews from the Pontifical States. 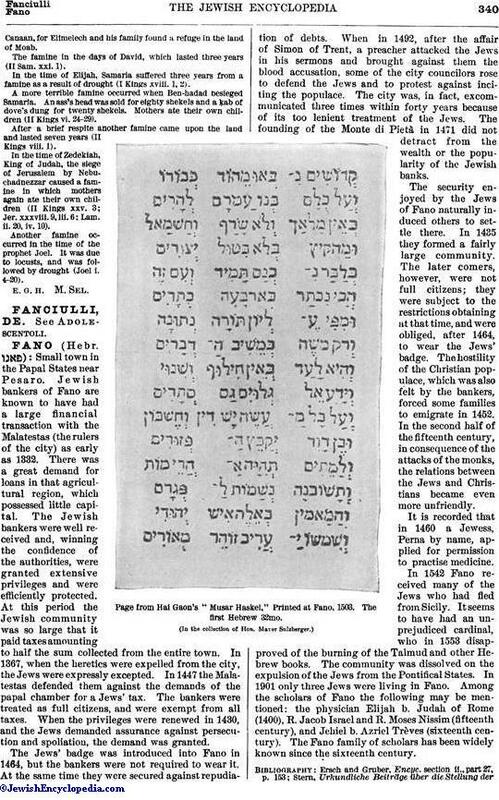 In 1901 only three Jews were living in Fano. Among the scholars of Fano the following may be mentioned: the physician Elijah b. Judah of Rome (1400), R. Jacob Israel and R. Moses Nissim (fifteenth century), and Jehiel b. Azriel Trèves (sixteenth century). 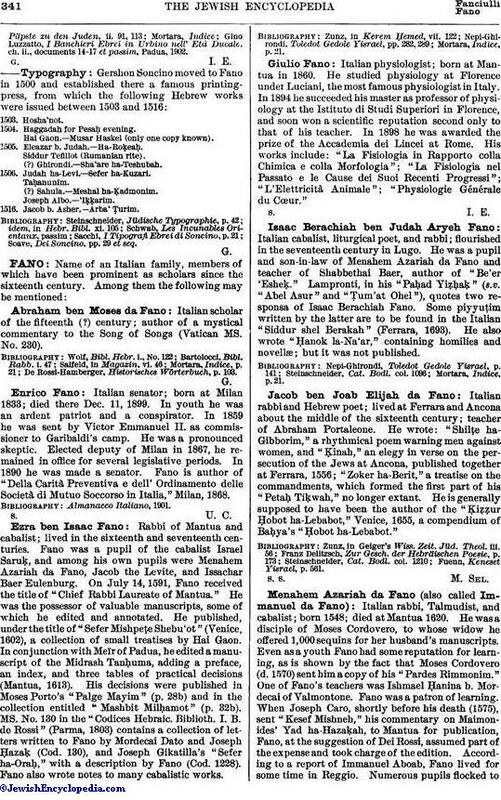 The Fano family of scholars has been widely known since the sixteenth century. Page from Hai Gaon's "Musar Haskel," Printed at Fano, 1503. The first Hebrew 32mo. Gino Luzzatto, I Banchieri Ebrei in Urbino nell' Età Ducale, ch. ii., documents 14-17 et passim, Padua, 1902. 1504. Haggadah for Pesaḥ evening.Hai Gaon.—Musar Haskel (only one copy known). 1505. Eleazar b. Judah.—Ha-Roḳeaḥ.Siddur Tefillot (Rumanian rite).(?) Ghirondi.—Sha'are ha-Teshubah. 1506. 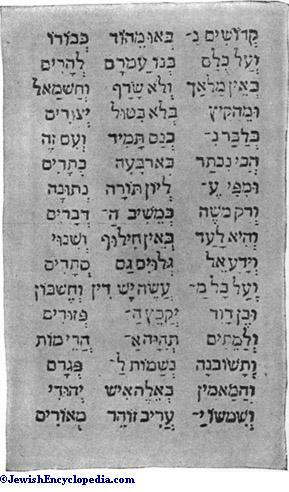 Judah ha-Levi.—Sefer ha-Kuzari.Taḥanunim.(?) Sahula.—Meshal ha-Ḳadmonim.Joseph Albo.—'Iḳḳarim. Soave, Dei Soncino, pp. 29 et seq.